Less is more—add subtle eastern touches to your home with these chic finds. When one thinks of Chinese-inspired interiors, austere rosewood and cold jade often come to mind. But this isn’t always the case. Put a new spin on an Eastern style living room by minimising clutter and selecting pieces that have distinct Chinese touches, yet are thoroughly modern. 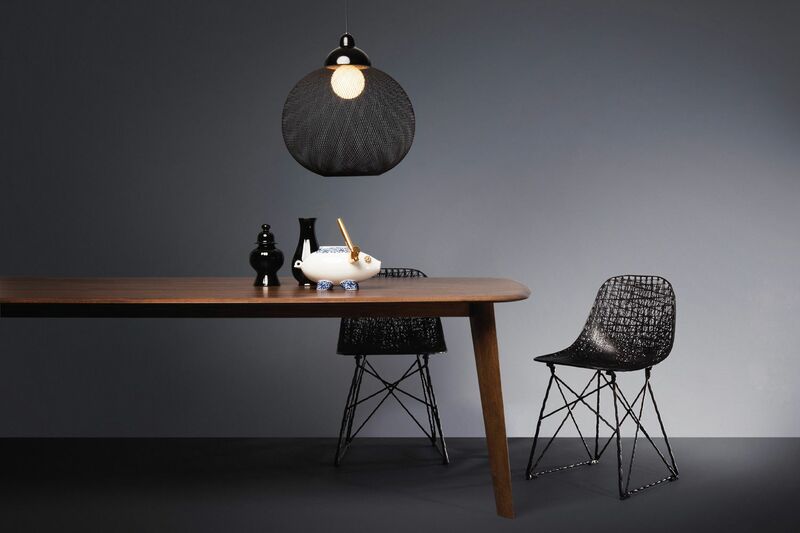 Made from fibreglass soaked in epoxy resin, Moooi’s black Non Random lights by Dutch designer Bertjan Pot look like many things—coils, yarn, soap bubbles, a pomelo hanging from a tree, mesh domes or lanterns. No matter what they look like to you, there’s something undeniably Eastern and mysterious about these lamps. Influenced by Art Deco chinoiserie and with a splash of retro sleekness, Baxter’s Mio sofa fires up the imagination, bringing to mind scenes from the iconic Wong Kar Wai film In the Mood for Love. Constructed with a pine and poplar frame sitting on turned and satin-finished brass feet, and upholstered in soft leather, Mio’s slim, slender silhouette is as graceful and alluring as actress Maggie Cheung in her tailor-made cheongsams. Available at Pure Interior; visit baxter.it for more information. Offering a contemporary take on the traditional Chinese marriage cabinet, Scottish designer Gavin Robertson uses fine white ripple sycamore and Macassar ebony to create a cabinet with distilled Asian aesthetics. Constructed with hand-cut dovetail joints and custom-made drop-down handles, this satin-sheened cabinet is ideal as a stylish and discreet media storage system. With its regal form and bold green-and-white design, the Labyrinth Chair, designed by Studio Job for Moooi, beckons modern-day emperors and empresses looking for an eye-catching, avant-garde armchair. A hint of ancient China comes through in the pattern on the fabric, which mimics fretwork often found in traditional Chinese bamboo furniture. Inspired by the patterns of tiles on the streets of Shanghai, Neri&Hu’s Jie collection is the brand’s debut project with well-known Spanish carpet brand Nanimarquina. The character of the 100 per cent hand tufted new wool rugs in blue or celadon green bears the essence of the Chinese ideogram “jie”, which means street or intersection. The designers profess that it is the dynamism of lively streets that they hope to convey in their design. Comprising four black walnut framed folding panels with bamboo latticework, the Twilight Bamboo Marquetry Folding Screen by Shanghai-headquartered Shang Xia evokes the mysteries of dynastic China. Bamboo strips of varying densities are used for the lattices, diffusing light in different ways, and producing shifting shades and shadows as the sun charts its course through the day.